Every home needs a door mat - make yours your own! MountainBilly Mercantile has the perfect personalized door mat for you! Welcome your family, friends, & visitors with personalized style! Why settle for a welcome mat that every other neighbor can pick up at the local store? Create a one-of-a-kind, unique to you doormat! Keep sloppy weather outside where it belongs with a custom-made welcome mat! Give the perfect gift to the person or family that has everything! How can they resist an entry rug especially made for them?! Design your own! Tell us what you want! Show your home state pride! Personalize with your family name! Tell everyone you’re a couple! Let it be known that Fido is the head of household! Or with the upcoming holiday! Customize with your home address! Great gift for holidays, weddings, or anniversaries! 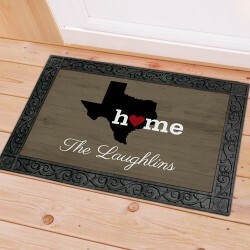 What better way to welcome people into your home than with a unique, custom-made, personalized doormat from the MountainBillyMercantile?! Tell us what you want & we’ll do our best to get it made for you! Greet all of your guests this holiday with our Personalized Baby Its Cold Outside Doormat. We'l..
Personalized Christmas DoormatPersonalized Floor Mats Choose between two great sizes, 18" x.. Choose between two great sizes, 18" x 24" or 24" x 36". Both are safe for outdoor or indoor door ..
Personalized Floor Mats Choose between two great sizes, 18" x 24" or 24" x 36". Both are safe for o..
Give a warm, solid welcome to friends and family members visiting your home with this Home Sweet Hom..
Mr. & Mrs. Personalized Welcome DoorMatSurprise your newlywed couple with a doormat personal..